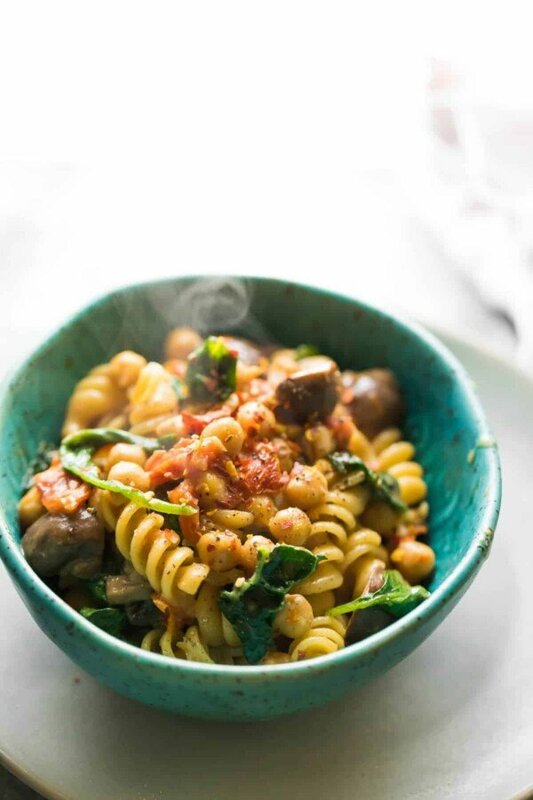 Sun dried tomato chickpea one pot pasta with mushrooms and spinach, which can be assembled up to 3 days ahead for a super easy meal prep dinner recipe! You know what I love? A fridge full of possibilities. Even better if those possibilities are already half way to a healthy meal. 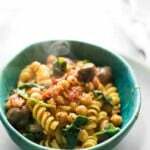 Today’s sun dried tomato chickpea one pot pasta is inspired by 5-pm, when your brain wants to power down for the day. You don’t want to think of a dinner idea. You don’t want to measure stuff. You just want to dump something into a pot and be done with it, right? This recipe takes only ten minutes to toss together in the pot, which seems pretty darn easy. But doing this step ahead of time? Even easier. Barely any measuring, hardly any thinking involved, and you can use your brain for other pressing 5-pm matters…like keeping your toddler from crashing his singing elephant ride-on toy into the wall, and your husband from opening the tortilla chips <– “it’s literally TEN MINUTES till dinner!! !” Those were weirdly specific examples. Not inspired by my own family, I swear! We’ve been eating more and more vegetarian meals, which is a-OK with me because it’s better for the environment, and a lot easier on our grocery bill. 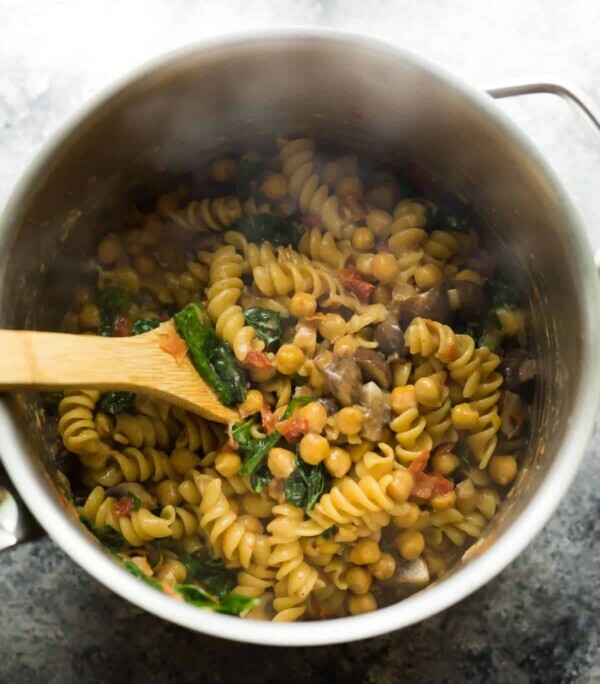 It’s been awhile since I posted a prep head one pot pasta recipe (this Make Ahead One Pot Black Bean Fajita Pasta was posted waaaay back in February! ), and it was time to revisit the concept. Ben is sometimes of the mindset that vegetarian can’t be filling, but both of us agreed: this sundried tomato chickpea pasta is very filling! 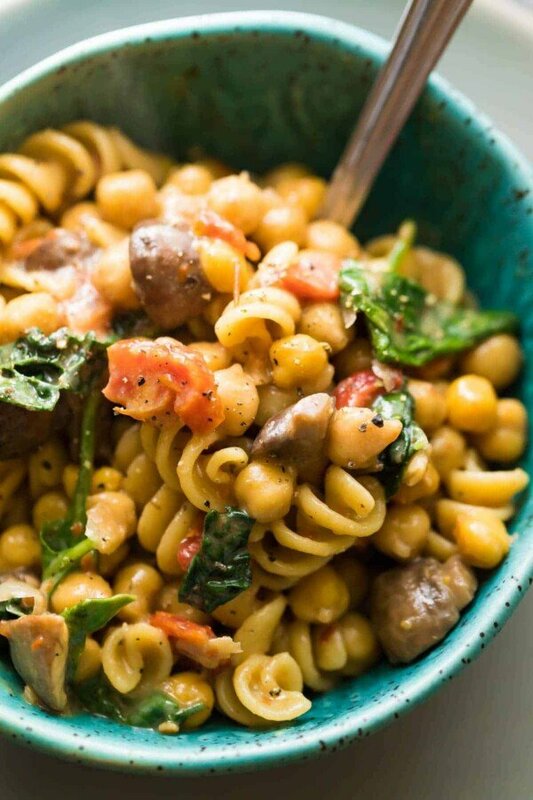 If you haven’t tried one pot pasta before, prepare to have your mind blown. So much flavor absorbs into the pasta as it cooks, and it gets so creamy even without adding cream. 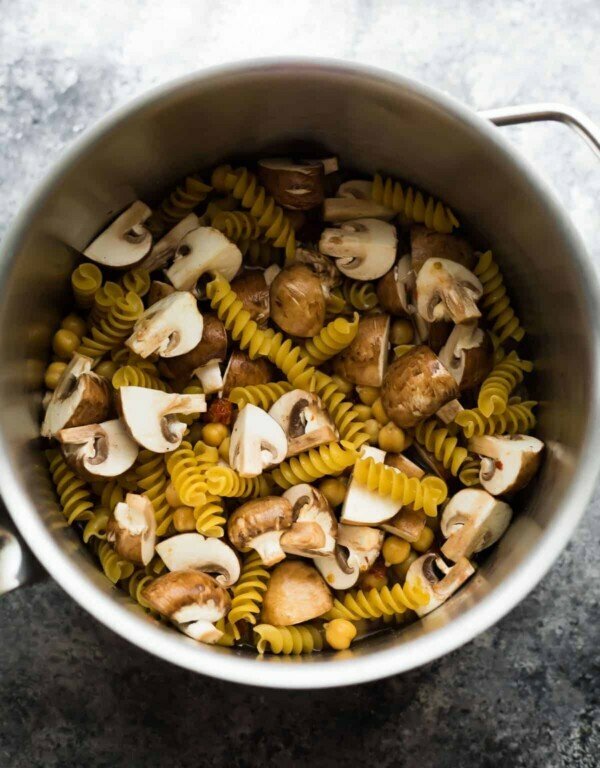 To Cook Right AwayIn a medium pot, combine the mushrooms, salt, pepper, red pepper flakes, sun dried tomatoes, chickpeas, pasta and stock. Cover, bring to a boil, reduce heat, then simmer for 10 minutes, stirring every 2 minutes. Stir in the spinach and cheese until cheese is melted and spinach is wilted. 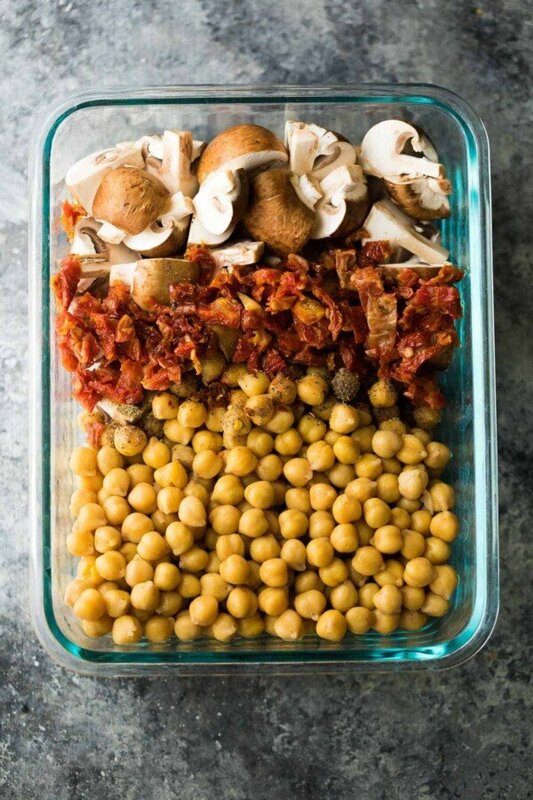 To Assemble AheadIn a storage container, combine the mushrooms, salt, pepper, red pepper flakes, sun dried tomatoes and chickpeas. Store in the fridge for up to 3 days (good for 5 days without the chickpeas). When you're ready to cook, add container contents to a pot along with the pasta and stock and follow the cooking directions above. I just recently started meal prepping and I was so excited when I found this recipe! It was very easy to make and tasted incredible. I will definitely be saving this to make again and again. I’m so happy to hear this! Thanks so much for taking the time to leave a review, Madison! I’m meal-prepping for someone else who doesn’t have um…. a kitchen haha. Do you think I could cook this ahead of time and keep in the fridge for her? How long do you think it could keep? Thanks!! Gasp! No kitchen! LOL! This should keep in the fridge for 2-4 days I’d think. Love this! I also doubled a lot of ingredients, and added half an onion, a little garlic, and juice/zest from half a lemon. Lots of good flavors for such a simple recipe. Oh and I used Parmesan for more of a salty “bite” to the cheese. Perfection! I upped all of the veggies and added some zucchini I needed to use since I didn’t have any chickpeas and wanted to be sure it’d still be robust. Mission accomplished! The sodium seems high for me ..is that because if the broth. Hi Olga, I believe the sodium comes from the sun dried tomatoes…delicious but high in sodium. This is so good! I just omitted the cheese to make it vegan. Does the mushrooms get rubbery with being boiled instead of sauteed? I don’t find them rubbery, but if you are not a fan of boiled mushrooms, you could certainly sautee them separately and add in. Do you have a suggestion for substituting the mushrooms? You can use another veggie…what about zucchini or bell peppers? This was awesome! And forgiving. I doubled the mushrooms, tomatoes, and chickpeas and added a chopped zucchini. Used just one cup of pasta and lowered broth to 1 cup too. Threw in a little paprika and basil. I’ll be making this again and again! Hello, cN i use canned spinach instead? I’ve never used canned spinach before so I can’t say for sure…if you try it, I’d love to hear how it goes! This dishy looks so hearty and so delicious. I have a hard getting chickpeas where i am for some reason but i’m sure that wont last forever so I’ll try this soon enough. Thanks for sharing this. This looks so good! I’ve never thought to combine sun dried tomatoes and chickpeas with pasta. I love a one-pot meal! Thanks! Hi Dionne, I’m testing whether the ingredients can be assembled ahead and frozen. I’m not sure about the mushrooms, as I’ve heard that raw mushrooms turn black after freezing.